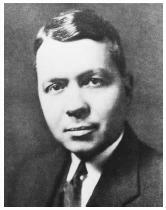 American chemist Harold Clayton Urey, recipient of the 1934 Nobel Prize in chemistry, "for his discovery of heavy hydrogen." Harold Urey was a prolific scientist whose research interests included chemistry, astronomy, geology, and biology. Although he did important work on isotope applications and cosmochemistry, Urey is best remembered for his discovery of heavy hydrogen, or deuterium, for which he received the 1934 Nobel Prize in chemistry. Urey was born in Walkerton, Indiana, on April 29, 1883. When he was six, his father died. His mother remarried and the family later moved to Montana. After graduating from high school in 1911, Urey taught in country schools in Indiana and Montana. In 1914 Urey entered the University of Montana and graduated three years later with a B.S. in biology and a minor in chemistry. During World War I he worked for a chemical company in Philadelphia, and after the war, Urey returned to the University of Montana as an instructor in chemistry. He enrolled in the chemistry department at the University of California at Berkeley in 1921 and only two years later received his Ph.D. in physical chemistry. After a year in Copenhagen, Denmark, Urey joined the chemistry faculty at Johns Hopkins University. He would later move to Columbia University, the University of Chicago, and finally the University of California at San Diego. In July 1931 Urey read a paper that proposed the existence of a stable isotope of hydrogen of mass 2, or heavy hydrogen. He decided to look for the isotope and designed an experimental plan with his lab assistant George Murphy. As a detection method, they chose to examine the lines in the atomic spectrum of hydrogen. Since the predicted natural abundance of the heavy hydrogen was only 0.05 percent, Urey hoped to detect the rare isotope by analyzing a sample of hydrogen enriched in heavy hydrogen prepared by Ferdinand G. Brickwedde, a physicist working at the National Bureau of Standards in Washington, D.C. While waiting for the enriched sample to arrive, Urey and Murphy analyzed a sample of regular hydrogen and were surprised to see evidence of heavy hydrogen (which Urey later called deuterium). Believing that it was an artifact of their detection method, Urey and Murphy decided to keep their results secret until they obtained further proof using the enriched sample. On Thanksgiving Day of 1931, Urey analyzed the sample of enriched hydrogen and observed the lines confirming the existence of deuterium. Urey received the 1934 Nobel Prize in chemistry for his discovery. He publicly acknowledged Brickwedde and Murphy's role by giving each of them one-quarter of the Nobel Prize money. Since 1913 scientists had accepted the existence of isotopes, but conventional wisdom claimed that isotopes of a given element could not be differentiated or separated by a chemical process. Urey challenged and overturned this thinking in 1932 by showing that deuterium (D 2 ) could be concentrated in the form of deuterium oxide, or heavy water (D 2 O), and then converted back into pure deuterium by electrolysis of the D 2 O. Deuterium and deuterium oxide are convenient sources of deuterium-labeled compounds that today are used routinely in medicine and science. After World War II Urey moved to the University of Chicago. While there, Urey perfected a method, also based on oxygen isotope ratios, that accurately measured the temperatures of ancient oceans. Urey additionally developed an interest in the chemistry of the solar system. In his 1952 book, The Planets, he argued that what we needed to understand the origins of the solar system was a thorough understanding of the Moon. Urey's work on the chemical composition of meteorites set the stage for later studies that explained the origins of chemicals in stars. Urey left Chicago in 1958 to become professor-at-large at the newly formed University of California at San Diego. He retired from that institute in 1970 and died in 1981. James, Laylin K., ed. (1993). Nobel Laureates in Chemistry 1901–1992. Washington, DC: American Chemical Society; Chemical Heritage Foundation. Arnold, James R.; Bigelstein, J.; and Hutchinson, Clyde A., Jr. "Harold Clayton Urey." Available from http://www.books.nap.edu/html/biomens/nurey .